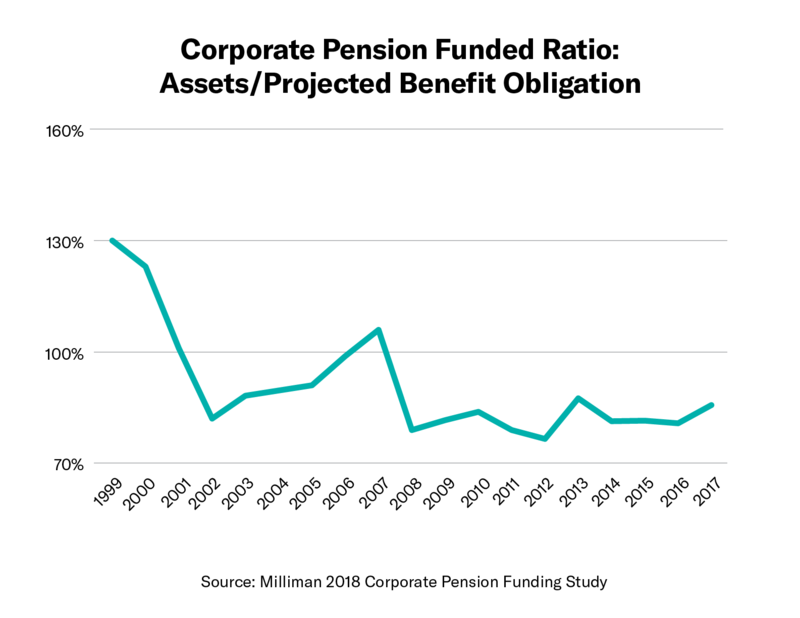 While it’s true that various institution types include liability driven investing (LDI) strategies in their arsenal, among those that do corporate defined benefit (DB) pension plans are the bellwether. According to a review of 1,400 corporate, public, and endowment and foundation plans by Investment Metrics, corporate DBs have “aggressively incorporated a liability-driven investing approach” since the beginning of 2014 through Q2 2018. Evidence of this can be seen in corporate plans’ “significant increase in U.S. fixed income allocation,” which rose by about 10% during that time period. At the same time, allocations by corporate plans to U.S. equities declined about 7%. 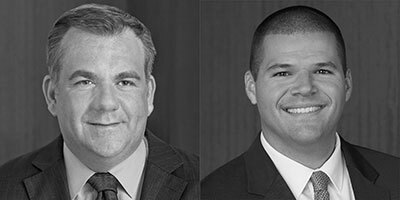 Gary Veerman (below left), Head of LDI Solutions, and Chris Anast (below right), CFA, Senior Retirement Strategist, Capital Group, pose and answer three questions all plan sponsors should ask. Plan sponsors have many factors to consider when making prudent pension risk management decisions. 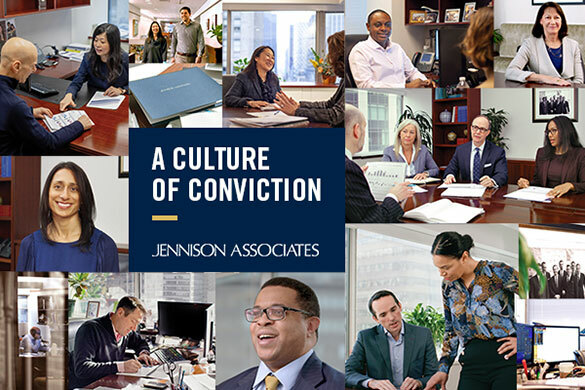 Equity results, interest rate movements, glide path development, Pension Benefit Guaranty Corporation premiums, contribution policy, company- specific risk tolerance, actuarial assumption changes – the list goes on. Moreover, many of these variables are outside of a plan sponsor’s control as they strive to achieve their ultimate objective: paying benefit obligations to plan participants. To cut through the complexity, we outline three fundamental pension risk management questions that all plan sponsors should ask themselves – regardless of their company-specific situation. Is pension asymmetry a factor in my strategic asset allocation decisions? Plan sponsors evaluate many different types of risk, and one of these is surplus risk – the variability of possible funding status outcomes over time. Its simplicity makes it an intuitive and frequently used metric in pension asset-liability analysis. Here’s the problem: pension plan outcomes are, in fact, asymmetrical. Even though upside and downside scenarios may be equally likely, their impact is very different. We propose that the “sweet spot” for most plan sponsors is between 100% and 115% funded. Above this range, there are diminishing benefits to an increased funding level. Below 100%, sponsors often take larger positions in return-generating assets with greater risk with the goal of pushing funded status higher. 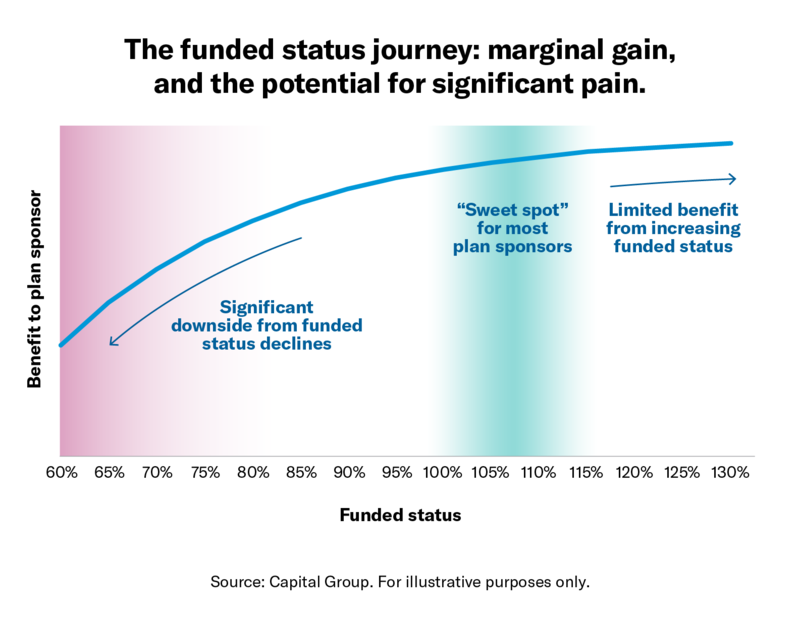 At the top end of the sweet spot, say 115% funded, sponsors certainly have a comfortable cushion to weather any “un-hedgeables” such as changes to actuarial assumptions, bond downgrades and modest funded status drawdowns. Arguably, any funded status gains above 115% funded result in little or no additional benefit to sponsor or participant. We often refer to this excess as a “trapped surplus” because funded status gains beyond a certain point cannot typically be utilized to create value for the firm or plan participants. On the flipside, when a plan’s funded status is below 100% there can be significant negative implications. And it only gets worse as funded status declines further. The potential pain for sponsors increases exponentially, with limitations on lump sums, large expected cash contributions, and a portfolio without the asset base to help close the funding gap. In these low-funded scenarios, cash contributions will likely be the largest driver of plans increasing their funding position. Am I hedging enough of my interest rate risk? Interest rates continue to be a hot topic, with most of the focus on where they could go. As many of us have experienced, including industry experts, accurately predicting the future path of interest rates is often a humbling experience. It is important, however, to take into account two strategic factors when making interest rate hedging decisions. The first is to recognize that interest rate risk is an uncompensated risk. The second factor to bear in mind is that hedging decisions should be based on the forward rates rather than spot rates. For a pension plan, equities and other return-generating assets are generally utilized to capture an expected return premium in excess of liabilities, to help improve the plan’s funded status and to cover the plan’s ongoing service costs and expenses. 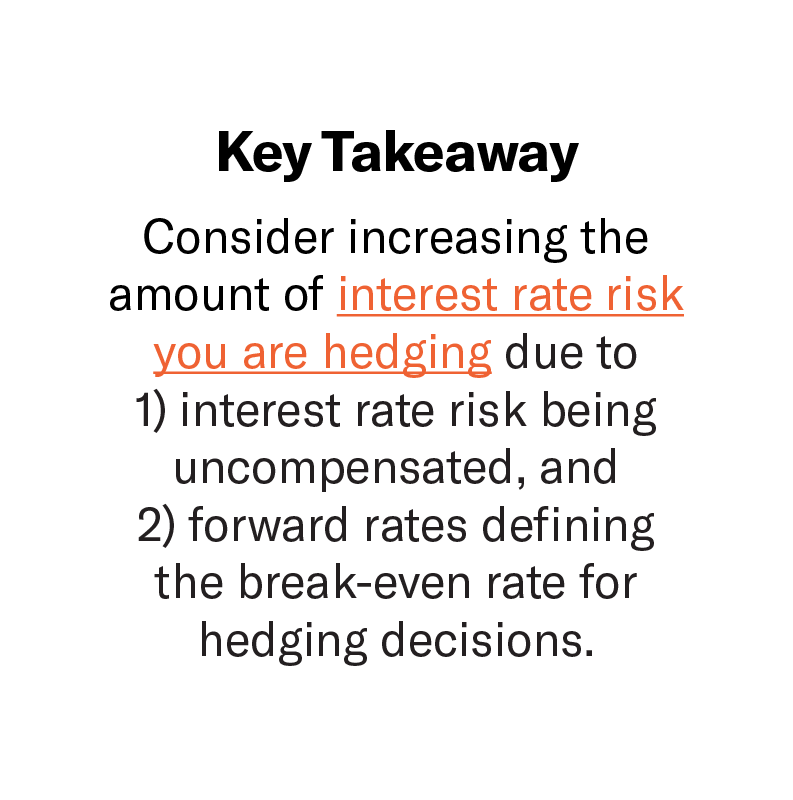 Additionally, while current interest rate levels are observable and easy to reference, it’s actually forward rates that matter when making hedging decisions. Forward rates are derived by current spot rates and reflect the arbitrage-free pricing of interest rates in future periods. Therefore, forwards will always be higher than spot rates when the yield curve has an upward slope. By definition, if forward rates are realized, all returns across the yield curve are the same over the time period analyzed. Importantly, this applies to both returns on hedging assets as well as liabilities. So, if forwards are realized, hedging assets and liabilities will have the same return due to interest rate movements, all else being equal. 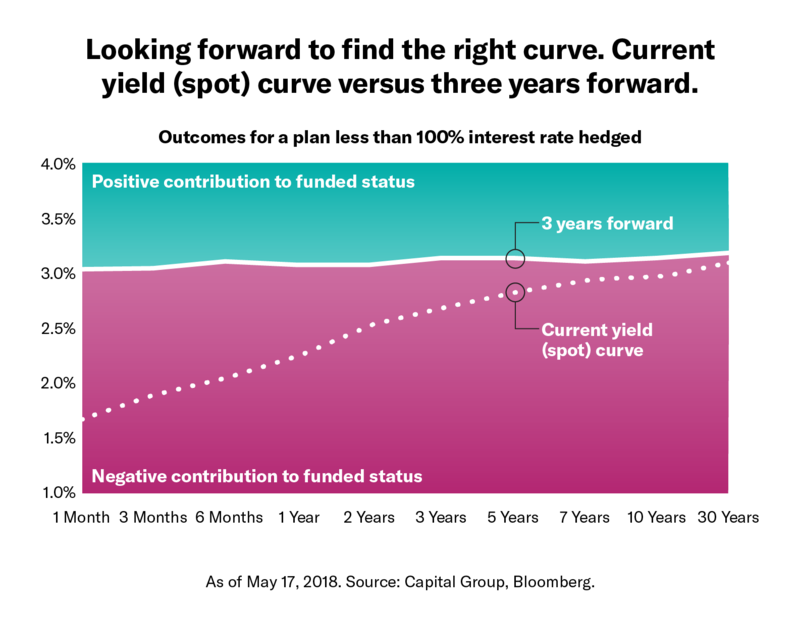 For an under-hedged plan, it is only when future interest rates exceed the forward curve that a plan will experience a benefit to funded status. In this scenario, liabilities will fall by more than assets, creating a positive funded status outcome for sponsors. Am I using my overall risk budget in the most efficient way possible? Statements attributed to an individual represent the opinions of that individual as of the date published and do not necessarily reflect the opinions of Capital Group or its affiliates. This information is intended to highlight issues and should not be considered advice, an endorsement or a recommendation. Bloomberg® is a trademark of Bloomberg Finance L.P. (collectively with its affiliates, “Bloomberg”). Barclays® is a trademark of Barclays Bank Plc (collectively with its affiliates, “Barclays”), used under license. Neither Bloomberg nor Barclays approves or endorses this material, guarantees the accuracy or completeness of any information herein and, to the maximum extent allowed by law, neither shall have any liability or responsibility for injury or damages arising in connection therewith. Randy Mitchell leads the investment consulting practice in Milliman’s Southern Employee Benefits group, working with pension and 401(k) plan sponsors, as well as foundations, endowments and other pooled assets. He spoke with Institutional Investor on why liability-driven investing (LDI) strategies are gaining traction in today’s markets. What are the differences between asset-liability modeling (ALM) and liability-driven investing (LDI)? ALM is a tool that shows pension plan sponsors the potential consequences of different investment strategies. By running Monte Carlo simulations incorporating plan assets and liabilities, it can provide a probability-based result, such as a 67 percent confidence of achieving a desired financial outcome. It allows a sponsor to coordinate investments in pursuit of financial goals, such as finding the appropriate combination of reduced risk and maximized investment return. Liability-driven investing (LDI) applies ALM to investment management in real time, aiming to reduce the volatility of a plan's funded status and contribution requirements on an ongoing basis. Can you provide an example of an LDI strategy? A common LDI strategy for corporate pension plans is to buy a portfolio of high-quality bonds with durations matching those of plan liabilities. This way, the sensitivity of the market value of assets to interest rate changes closely matches that of the liabilities. The investments and liabilities move in tandem, and the net funded status stays relatively consistent from year to year. Why are more plan sponsors considering LDI strategies now? For the past few years, interest rates have been so low that many plan sponsors shifted allocations away from fixed income aiming for potentially higher returns in equities. Now that U.S. interest rates are going up, fixed-income assets are generating higher yields. That improvement in returns, coupled with the volatility of the equity market, is making LDI strategies more attractive today. Can LDI strategies reduce market risk exposures? Yes. Applying an LDI strategy to, and increasing the percentage of assets in fixed-income can reduce the impact of a market correction that affects both equities and bonds. What do you suggest in terms of implementing an LDI approach? One approach is to adopt a glide path that links LDI allocations to the plan’s funded status. As the plan’s funding levels rise, the sponsors gradually commit more fixed-income assets to a protective LDI strategy. If market conditions change, can you adjust an LDI strategy? Yes. We review these strategies on a monthly basis, and can rebalance the fixed-income allocation so that it matches the current liabilities. Do LDI strategies require an increase in allocations to fixed income? No. Plan sponsors can keep the percentage of fixed-income assets the same, but make it LDI-smart – i.e. liability matched. That provides an increase in interest rate protection without giving up the potentially higher returns from equities. How do you address the yield curve? A data-rich actuarial report that covers the projected flow of benefit payments into the future should break down the plan’s liability pool into short (1-4 year), intermediate (5-19 years) and long (over 20 years) segments to match the current yield curve of fixed-income assets. What about terminated or frozen pension plans? Many sponsors of terminated or frozen plans have adopted LDI strategies to protect the accumulated assets without the risks of a drop in value due to a market correction or change in interest rates. Are there any issues with LDI from a fiduciary perspective? None that we’ve seen. LDI strategies can support a plan’s fiduciary responsibility. Are there misconceptions about LDI? Traditionally, plan sponsors have viewed volatility as a function of returns over time. As a result, their ALM strategies have focused on reducing the variance of returns. However, in corporate pension plans sponsors also need to consider the volatility of contributions and funded status. Can you elaborate? Federal regulators focus on funded status in their annual reviews of a pension plan’s status. Corporations do as well but also on cash contributions. Therefore, a sudden change in funded status impacting corporate contributions just before a plan’s year-end review – caused by a rise in interest rates or a drop in the financial markets – can have significant consequences for plan sponsors. Funded status is an accounting measure of how close a plan is to funding 100 percent of its obligations. An unexpected dip in interest rates, for instance, could drop a plan’s funded status below 80 percent causing certain plan restrictions to kick in. In that regard, LDI strategies can be an effective way to maintain a plan’s funding status or lessen the impact of a market downturn. Any other suggestions for plan sponsors? When thinking about volatility, sponsors should look at strategies for smoothing the flow of contributions and funded status, rather than just market returns. LDI strategies can help sponsor achieve consistent and predictable results regardless of market conditions. Milliman is among the world's largest providers of actuarial and related products and services, helping clients protect the health and financial well-being of people everywhere. For more information, visit milliman.com. The following is republished with permission from Mike Clark, Consulting Actuary, the Principal Financial Group. It was originally published on February 28 of this year. To read more recent pension risk insights from him, go here. Earlier this year, in a January 24 blog, I made a thoroughly actuarial comment that a liability driven investment (LDI) strategy can protect defined benefit (DB) plans against the risk of net loss in times of uncertainty. It seemed like a quaint thought at the time as market volatility had been on hiatus for almost two years. Then, seemingly on cue, equity markets immediately cratered. The S&P 500 shed 10 percent between January 26 and February 8, technically satisfying the definition of a market correction. Experts confirmed the slide was caused by concerns about inflation, and nothing directly attributable to any of my comments – so the slide wasn’t my fault! A typical traditionally invested DB plan – say 60 percent equity and 40 percent core bonds – lost 2 to 3 percent on their funding ratio in those two weeks. This temporarily erased all the gains for the entire year of 2017. Fortunately, markets have since regained their footing and corporate bond rates have risen, so the net impact of this turbulence has been relatively slight. Consider it a learning opportunity – a free refresher course on volatility without permanent damage to funding ratios. Expectation of rising interest rates is often cited as a reason to postpone implementing an LDI strategy. (This is because shorter duration bonds generate positive net returns against pension liabilities when rates rise.) Hesitancy to exit a one-directional bull market is another. These are certainly valid thoughts, particularly for underfunded plans. But if the correction indeed signals the dawn of a new era, one of rising rates and increased equity volatility, LDI may be worth another look. When to reduce equity risk? When to extend fixed income duration to reduce interest rate risk? The answers to these questions will vary based on plan sponsor financial strength, economic outlook and funded status. Regular funded status updates are critical in constructing LDI glide paths and timing allocation changes. A well-executed LDI strategy can significantly reduce the risk of negative net returns regardless of what equity markets or interest rates decide to do. Mike Clark is a fellow of the Society of Actuaries (SOA) and member of the American Academy of Actuaries (AAA), and is very sorry if it turns out this all actually is his fault.